Baby sleep is a much talked about subject for new mums and it seems to be a hot topic at the baby groups I attend at the moment, especially since a lot of the mums have young babies. Luckily for some their little lambs sleep a full 12 hours right through (I'm actually so jealous) but for others, such as myself, this just isn't the case. I'm not saying Harlow's a bad sleeper, some nights she'll get up 4-5 times for a feed and other nights it'll only be once or twice, but anything that will help her sleep for longer is a bonus for me. That is why, my dear readers, that when Slumbersac offered Harlow and I the chance to test out one of their baby sleeping bags I happily said yes. Slumbersac is a young but fast growing family business that is based in Dorest in the UK. It's run by Karina Grassy with help from family and a small team of employees. Karina is mum to her 6 year old daughter who has been using Slumbersac sleeping bags ever since she was born, and she still continues to do product testing when it's called for. First impressions are good, the packaging is simple with your sleeping bag popped into a zip lock style bag which also contains the product information. The zip lock bag is handy for keeping the sleeping bag clean whilst storing or transporting when not being used, and I've actually kept the product information sheet as it's handy so there was no packing to throw away. I don't think that's ever happened before! Harlow received the Forest Friends design Slumbersac which is super cute and suitable for a boy or girl. 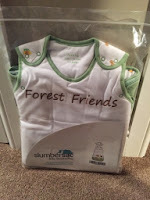 It's made from soft white jersey cotton and features some adorable forest animal embroidery on the front and on the back it has the forest friends characters printed all over. The outer fabric and lining is made from 100% jersey cotton and the baby sleeping bags are padded with soft polyester fleece which allows them to dry quickly after washing and helps to prevent allergies. 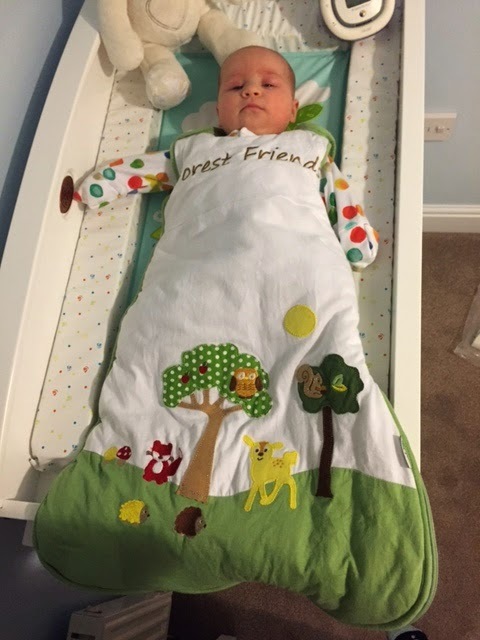 The Forest Friends design comes in four different sizes (0-6mths, 6-18mths, 12-36mths & 3-6yrs) and two different tog ratings (2.5 tog & 3.5 tog). Harlow was obviously sent the 0-6 months size and I chose to have the 2.5 tog since our house temperature generally doesn't drop below 18oc at night. This sleeping bag really is lovely. It's been washed a good few times now and has still kept it's shape. Harlow's nappy leaked one night and I had to wash it at 60oc (even though it recommends 40oc) and it still came out looking good. The inside fabric has started to bubble a little but not the outside. You can use it from birth as long as your baby weighs 4kgs, which is around 8.8lbs, to avoid them slipping into the sleeping bag. For babies under 10lbs there's popper studs under the arms which can be used to make sure their arms don't slip back into the sleeping bag as well which I've been using with Harlow and they work perfectly. For bigger babies you just pull down the zip on the right hand side of the sleeping bag and open the top popper studs for each shoulder, pop your baby in, close the shoulder popper studs, zip up the sleeping bag and you're done. There's an extra piece of fabric and stud on the right hand side to cover the zip when closed so baby doesn't hurt themselves on it. This has been a great sleeping bag for Harlow, keeping her warm and snug at night which means she sleeps that bit better when I put her back in her own bed after having been breastfed. I think because she is still warm in the sleeping bag and not going directly into a cold bed helps. 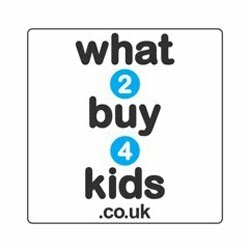 There's so many different designs to choose from in the baby sleeping bag range on the Slumbersac website, some more aimed at girls and some more for boys. There are a few unisex ones in there though so plenty to choose from. 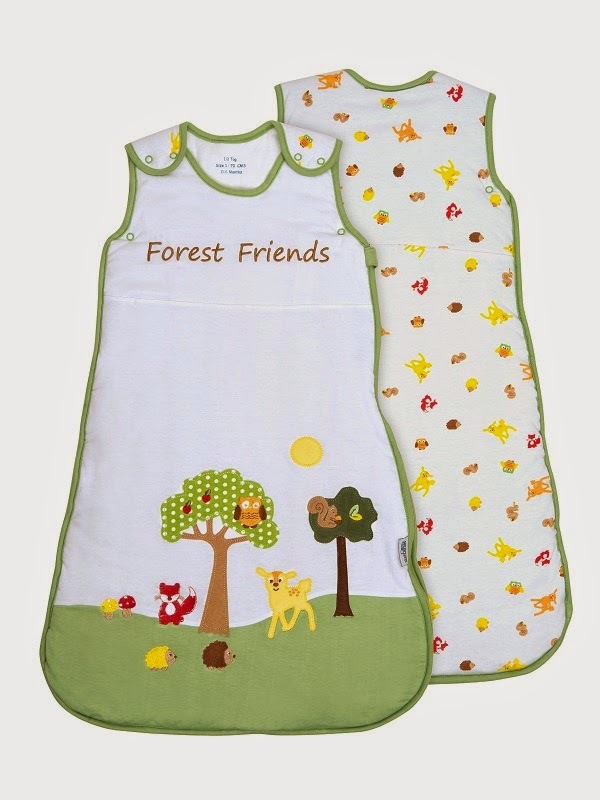 For the Forest Friends sleeping bag prices range from £18.99 to £31.99 depending on size and tog however some sleeping bag designs can be purchased for as low as £14.99 which is a fab price. 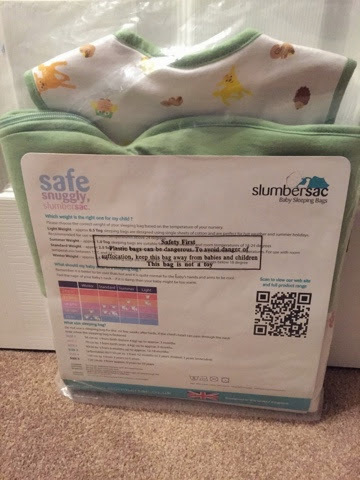 Overall a lovely product which has kept Harlow warm and snug at night meaning she sleeps a bit longer sometimes and in turn I get a bit more sleep. Pricing is great for what you get so big thumbs up for that plus delivery is free and so is returns. There's plenty of variety to choose from and the designs are all very cute. It's a shame the inside fabric has bubbled a bit but at least the outside hasn't. This would make a great gift for any new mum since it's practical and they should get quite a long use out of it compared to clothes etc. We're quite happy with ours. For more products and information please go to www.slumbersac.co.uk. You can also see what Slumbersac get up to on Facebook and Twitter so why not pay them a visit. 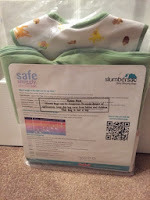 0 comments on "Review: Slumbersac Baby Sleeping Bag"